For big and small stores, providing shoppers with comfort is critical—but so is minimizing downtime and overhead costs. In fact, U.S. retailers use 77% of their total energy on electricity, averaging nearly $5.2 billion1. Don’t let inefficient systems or costly downtime steal your profits. 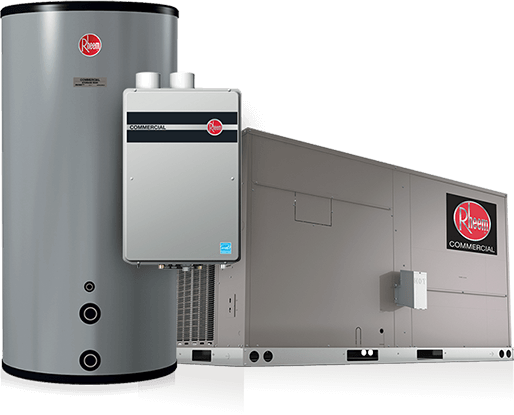 Count on Rheem—the world’s only provider of complete air, water, refrigeration and integrated solutions. Let our knowledgeable retail experts show you how our commercial air, water and refrigeration solutions can help big box, small box, convenience and grocery stores avoid downtime and run more efficiently. Through our partnership with Fernwood Capital & Leasing, Commercial KwikComfort® Financing makes it easy to get financing for the business equipment you need, when you need it. With a new partnership in 2016, Russell®, Witt®, Kramer® & ColdZone® are now part of the Rheem family brands—offering complete line of energy-efficient commercial refrigeration equipment & system solutions. 1Source: Energy Information Administration, Office of Energy Markets and End Use, Forms EIA-871A, C, and E of the 2003 Commercial Buildings Energy Consumption Survey.